Today’s society places tremendous significance on physical appearance, material possessions and money. From a very young age, we are programmed to want more and more, and often place greater importance on “things”, rather than people and relationships. 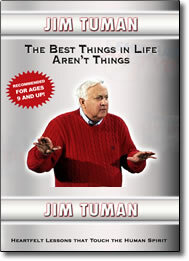 Jim Tuman illustrates how to get back in touch with the true essence of life through real-life stories that will touch your heart and soul. He shows people of all ages how to cut through the barriers to create more loving, caring relationships with the most important people in their lives. He also teaches how to be more compassionate and open-minded with people who are different. With Jim’s intense style and captivating presence, kids and adults alike will thoroughly enjoy this program.